The Centre for Gambling Research at UBC is revisiting some classic gambling films in a new blog series “Gambling in the Movies”. They’ll be reviewing the media’s portrayal of gambling, the relationship between gambling and addiction, and the extent to which these films provide any true insights into the psychology of the gambler. Below is an excerpt of the first post by Spencer Murch, a first-year Masters student at the Centre for Gambling Research at UBC. 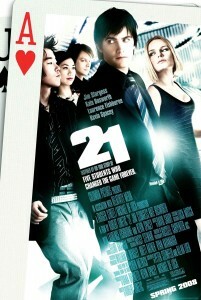 Having been given the first choice of gambling flicks, I chose the venerable champion of new-millennium gambling movies, Robert Luketic’s “21” (which also happened to be my first date-movie as a teenager). Released in 2008, 21 is an adaptation of “Bringing Down the House,” by Ben Merzrich. Starring Jim Sturgess and Kevin Spacey, the film tells the story of Ben (Sturgess), a bright MIT undergrad who, trying to pay for Harvard Med, joins a group of students led by Professor Rosa (Spacey). After each week of classes, the team flies to Vegas to wager, and win, millions by using a card-counting blackjack strategy. Blackjack is one of a small handful of casino games in which the player can, by using different strategies, improve their odds of winning. In blackjack, card counting allows the gambler to adjust their bet at points in play where desirable cards are over-represented among the cards yet to be dealt from the deck. As the number of low-value cards drawn increases, and as the number of cards remaining in the deck decreases, the likelihood of drawing a high-value card becomes more certain and the chance of hitting close to 21 improves. Read the full review and blog post. Recommend your favourite gambling film at gamblingresearch@psych.ubc.ca. This entry was posted in Psychology, Research and tagged Gambling on October 8, 2014 by Bonnie Vockeroth.